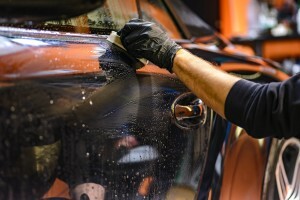 What you need to know about having your car windows tinted and how to choose the best service. There are many benefits to having your vehicle’s window tinted. From reducing the glare for a safer drive, to increasing privacy, adding value, to making your ride look amazing! • Windshield: Non-reflective tint is allowed above the manufacturer’s AS-1 line. • Front Side windows: Must allow more than 28% of light in. • Back Side windows: Must allow more than 15% of light in. • Rear Window: Must allow more than 15% of light in. • Back Side windows: Must allow more than 6% of light in. • Rear Window: Must allow more than 6% of light in. The process of applying the colored film to your windows should be done by a trained professional with skill and expertise. This ensures the tint will look great for the entire time you own the car, it won’t peel, bubble, fade, or blister. You can always consider either applying the tint yourself, a fly by night company, or using less quality film, but you will definitely notice the difference. Looking for quality window tinting in Central Florida that is affordable? Rite Now Mobile Detailing has several cost effective solutions to suit your needs. We are so confident that you will love your vehicle window tint that we have a money back guarantee. We service the Orlando area, with shops in Windermere and Ocoee.